Friends of the Edgefield County Public Library cordially invite everyone to attend the ribbon-cutting ceremony for the new Children’s Area on Thursday, April 18 at 4:00 PM. A reception will follow. Refreshments will be served. 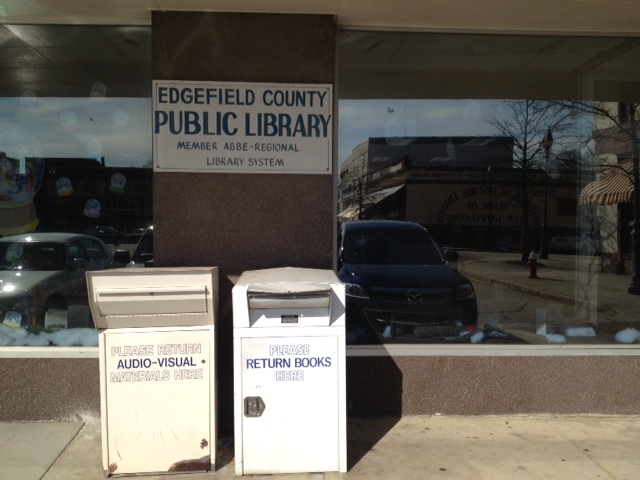 Dedicated to the memory of Dorothy Hart Mims, a lifelong supporter of the Edgefield County Public Library, the renovation of the children’s area was sponsored by The Friends of the Edgefield County Public Library (FOL). The camping theme was carried out by Aiken artist, Jeannie Rounsfell, who painted a pine tree in the corner and a lake with fishing boats above the bookshelves on the back wall. Two comfy Adriondacks-style rockers and a low checkers table comprise the area’s furnishings. A milepost gives directions to exotic places, including China (7,072 miles) Atlanta (143 miles), Myrtle Beach (175 miles) and Morocco (4,171 miles), among others. The Library’s young patrons are already enjoying the setting for the weekly Tuesday morning Story Time and other activities. The ribbon-cutting will open the area officially and call public attention to this lovely addition to the Library’s ongoing efforts to attract, entertain, educate, and enlighten us all. One Response to "Dot Mims Memorial Children’s Area to be Dedicated"
The dedication celebration was a wonderful event, thanks to Ann Day and the Edgefield Friends of the Library. Thank you so much for all the love you put into this project; I know Mrs. Mims would love it!